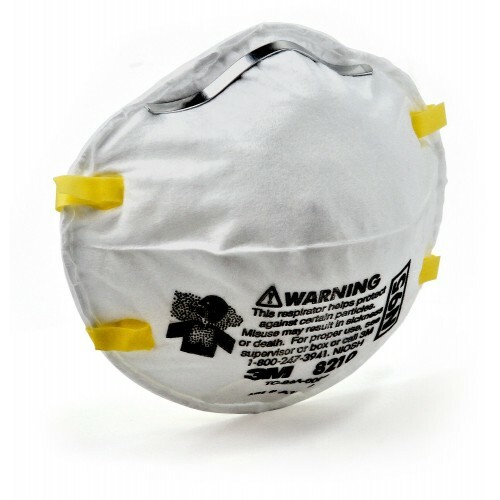 The 3M™ 8210 N95 Disposable Particulate Respirator is suggested for workplace applications such as grinding, sanding, sweeping, bagging and other dusty operations. Recommended for sanding, Grinding, Sawing, Sweeping and insulating work areas Use for solids such as those from processing minerals, coal, iron ore, flour, and other particulate substances. Use for solid and non-oil based particles. The 8210 may also be used with Liquid or non-oil based particles from sprays that do not also emit harmful vapors. Also shall be used as a must having protective mask against dust / Flu -Recommended for H1N1 Swine flu / H5N1 Avian Bird Flu / SARS Do Not Use for, gases and vapors, including those present in paint spray operations, asbestos, arsenic, cadmium, lead, methylenedianiline also know as MSA, or sandblasting. Aerosol concentrations that exceed 10 times the OSHA PEL, or applicable exposure limits. This respirator does not supply oxygen. Do not use for paint spray, oil aerosols, vapors, asbestos or sand blasting. features of this N95 disposable particulate respirator help promote greater worker acceptance and increased user wear time for better compliance. Its patented filter material, 3M™ Advanced Electret Media, traps dust and other particles while allowing for easy breathing. The respirator's adjustable noseclip and soft nose foam helps provide a custom fit with secure seal and reduce eyewear fogging. These features, along with the welded strap attachment and lightweight construction promote greater worker acceptance and may help increase wear time. This respirator features 3M's Advanced Electric Media (AEM) and adjustable nose clip to help provide a custom fit and secure seal.